Shopping for a new stovetop pressure cooker can be confusing. With a number of products in the market, how do you choose? We’re here to help. We’ve done all the research and present you with options whether you have a low or a high budget. Because we believe that pricey ones aren’t always the best; and you can find a cheaper yet good ones, too! We promise that these are the best ones and hopefully you’ll find the best stovetop pressure cooker for you. When looking for a good stovetop pressure cooker, go for a product that offers great quality at a reasonable price. This is why we highly recommend the Presto Pressure Cooker because now you can buy a heavy-duty pressure cooker without burning a hole in your pocket. This cooker has an 8-quart capacity, making it easy to cook meals for the whole family. It has a special tri-clad base so you’re assured of uniform and fast heating. 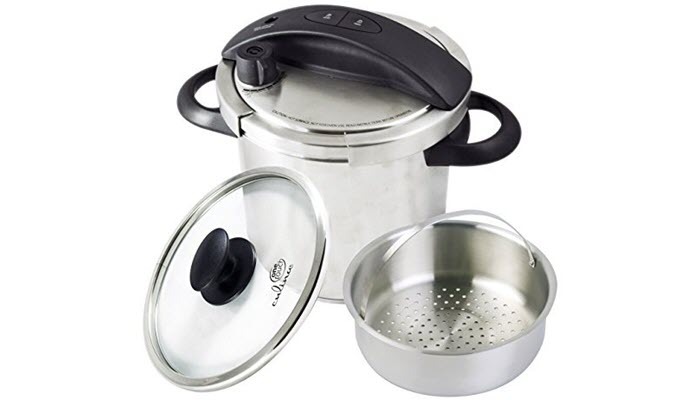 This pressure cooker is made of durable stainless steel and can be used either on smooth-top or regular ranges. It comes with a cover-lock indicator that prevents you from opening the lid unless there’s no more pressure. Newbie in the kitchen? This cookware comes with a recipe book to help create splendid dishes. 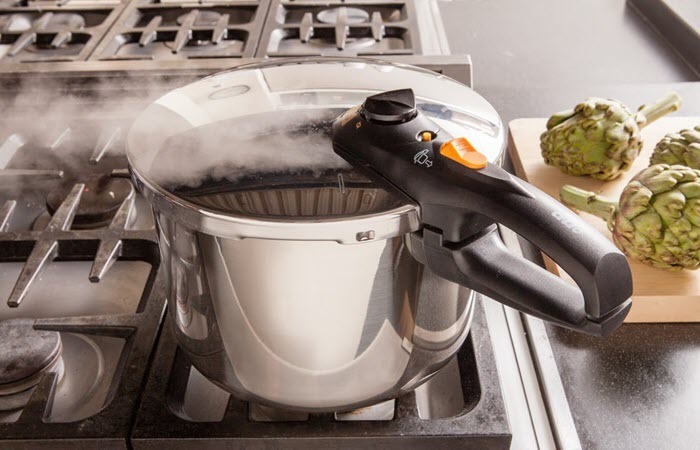 It even has a steam release valve that allows you to “cool” your food effortlessly, as well as a pressure regulator that automatically maintains the right cooking pressure. 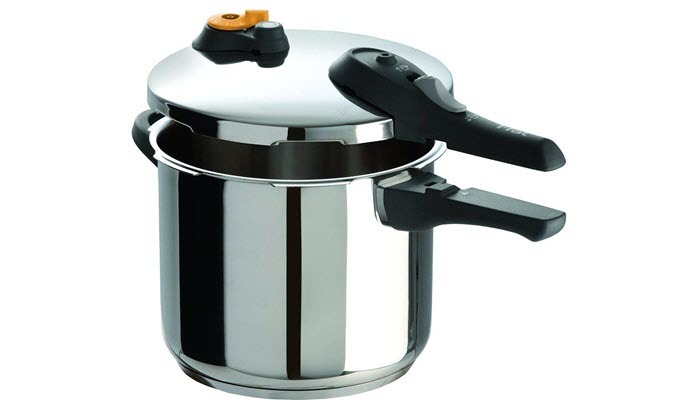 Another pressure cooker made of stainless steel is this T-fal Pressure Cooker. This 6.3-quart cookware is highly durable, easy to clean, and has a variable control valve that cooks at 10 or 15 PSI depending on your meal. This pressure cooker is equipped with a secure locking lid for safety and riveted, durable lids for easy transport and an added grip. Another great thing about this cooker is that it will not open when it’s already in use and under pressure. It even comes with a stand and a steam basket so you can steam different kinds of food at the same time. This cooker is also perfect for people with induction ovens. You can even cook food up to 70% faster while keeping the flavor and without losing all the important nutrients compared to other cooking methods. What makes the Fissler Vitaquick Pressure Cooker different is that it’s silent. It’s made of stainless steel, making it another great option if you’re looking for a new addition to your kitchen. 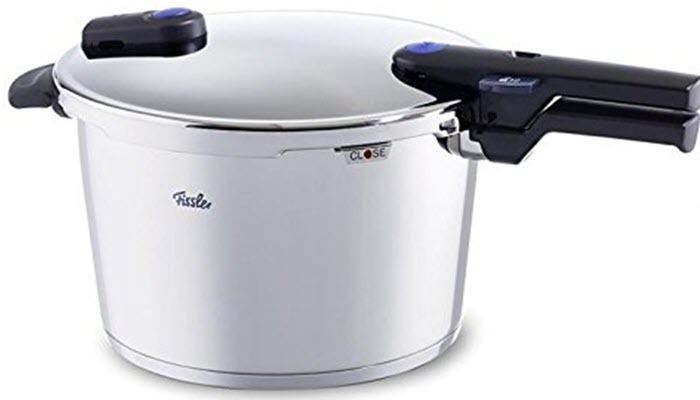 This 8.5-quart cooker has a steam release function. This means your food will turn out perfect because steam will no longer build up in the handle and inside the actual cooker. It also comes with a large indicator with two markings that you can switch between gentle and speed settings. There’s even a measuring scale inside the pot to save you from any hassle of measuring your ingredients. It features a practical positioning aid which makes positioning and closing the lid super easy. Plus, this pressure cooker has a locking indicator that gives out a sound and turns green to tell you that it’s already closed and ready to be used. It is made of high-grade material to ensure an even heat distribution and can be used on induction cookers, too. Clean up is also a breeze—just place the lid under running water and you’re done! Its pot is shaped like a cone so other cookers can be stacked inside as long as they have the same diameter. We think this is a great feature for those of you who don’t have a large space. 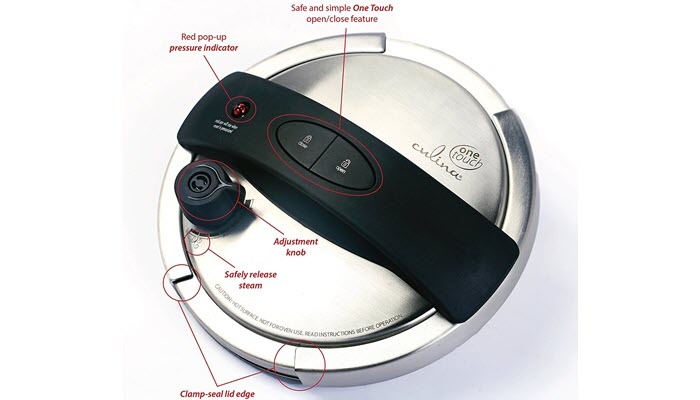 The Culina One-Touch Pressure Cooker promises to feed not only your tummies but your eyes, too. It cooks meals faster by 70% while sealing all the vitamins, flavor, and the vibrant colors of any meat or vegetables. It can even be used for canning and comes with a recipe to help get you started. This pressure cooker has an 18/10 stainless steel body for that satin finish and an aluminum base for even heat distribution. It can be used for any type of stovetop including induction. Like the previous product, there are markings inside the pot for quick and easy measurements and correct pressure. It also comes with a steamer insert for seafood, vegetables, etc. Most importantly, this cooker has six safety features. These include a pressure indicator to show you when it’s already pressurized, large handles, a safety valve, and a BPA-free silicone gasket. All pressure cookers included in this list are made of stainless steel. Want to know its importance? Read on and check out the other guidelines to keep in mind when looking for a pressure cooker. But not just any type of stainless steel! It must be made of 18% chromium and 10% nickel (18/10) for more durability, shine, and so that it won’t stain easily. This actually depends on how much you cook, your budget, and how much space is available. You can go with the smallest one, but we do suggest buying a 6-quart as a start. Fifteen PSI is the accepted minimum pressure for pressure cookers, so keep this in mind when getting a new one. Check if your new pressure cooker has any form of pressure indicator to keep the guesswork out of the way. It must also have a quick release feature. This is helpful when adding new ingredients because it allows you to lower the pressure while still maintaining the temperature inside the pot. Modern pressure cookers come with a valve that allows steam to escape to avoid overpressure. Other features are a locking lid that doesn’t allow you to open the lid unless there’s no more pressure, and large and riveted handles for easy transfer. Out of the 4 stovetop pressure cookers in this list, the Presto Pressure Cooker proved to be the best. 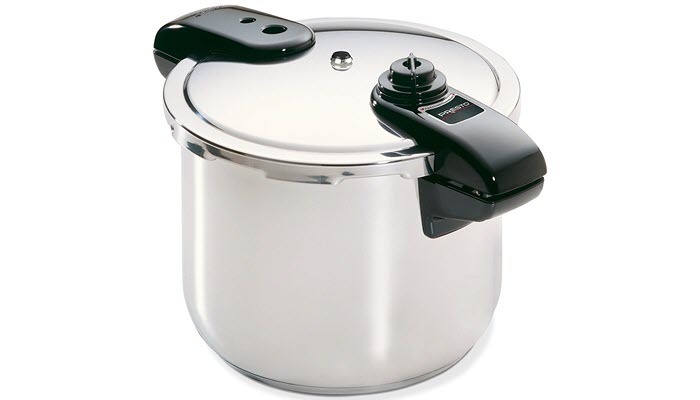 It gives you the best value for money and meets all the guidelines of what a good pressure cooker should be. If you are looking for more appliances to add to your kitchen, why not consider getting a microwave oven or a slow cooker you can use for bone broth. A coffee maker is a great choice, too.